A photo of the bus windshield, originally posted to UU's Facebook page. Around 9:15 tonight, six to eight shots were fired in the approximate location of the former Fresh Harvest Market on the 4600 block of Sheridan. 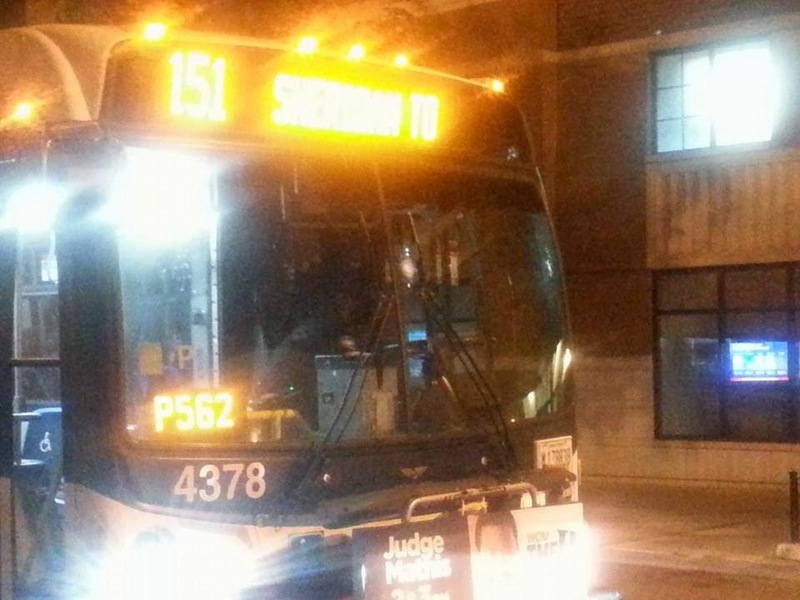 No apparent injuries, but a southbound Sheridan bus took a bullet to the windshield. Cops were quickly on the scene and involved in a foot chase east on Eastwood. According to readers who listen to the police scanner, the person they are seeking is well known to them. We'll update with any new developments as we hear them. Update: There are unconfirmed reports that a young male was hit in the shoulder. Update: Confirmed that a 17-year-old male was hit in the shoulder. He is in good condition after taking himself to Thorek Hospital. I live on Eastwood and Sheridan. There were 4 shots. How do I know this? I was walking my dog on Eastwood towards Clarendon when it happened. It was behind me when I was almost the Weiss. Didn't even phase me, I kept walking and let my pooch run around in the empty lot across the street from the parking garage. I've lived in this neighborhood for 25 years and it's practically a paradise compared to how it used to be. NBD. Since you don't live here already you won't need to rent a U Haul on from that place on Broadway. It's a win win! 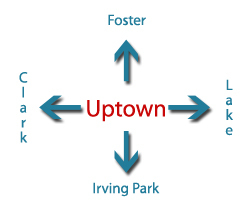 :-) What ID will you use here and at other Uptown related sites when you "leave"? Come on there are hundreds you've already created to choose from. After I heard the shots, I walk over to Sheridan (I'm on Kenmore, directly across the alley from the shuttered market) and see three bikes laying on the ground (perhaps belonging to the shooters and/or the victim), and an ambulance by the McDonald's parking lot. Homeless folks aren't the problem in this neighborhood, gang bangers are. Are there homeless gang bangers? Yup, but more often than not the homeless are harmless and more of an "unsightly blemish" as people on this blog are wont to declare. Dylan Peter are you responding to my post? Sorry if you misunderstood my intentions. I simply said loitering is a problem not that the homeless are of disturbance or anything as such. I have no problem with the homeless only that of they are being harassed more than the gang members! Yes the gang members ARE the problem I will concur 100% with that but the main issue is help...helping the homeless off the streets...helping the communities of this city to not fear walking around their neighborhoods etc. that was the point of my message not to put down the homeless. 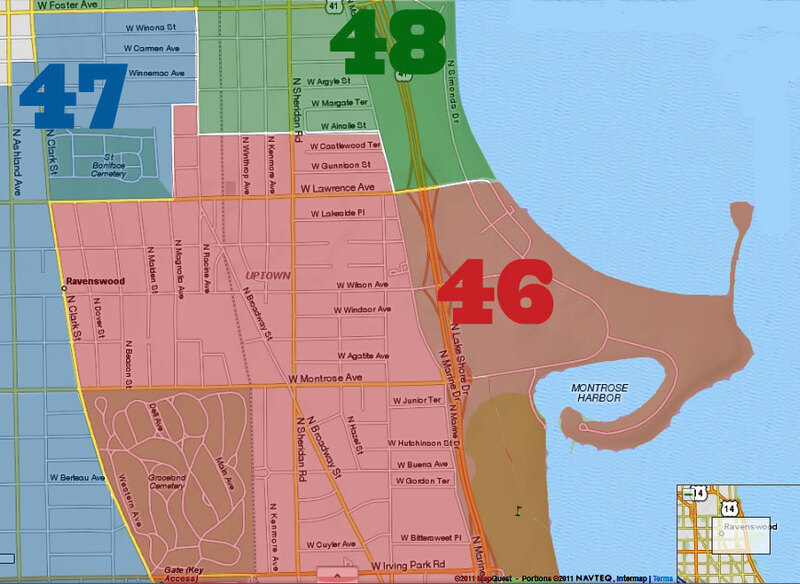 Matter of fact, homelessness is a problem no matter which area, city, state we live in. Chicago needs to bring back the old Vagrancy Laws that required everyone to have a minimum amount of money on them at all times. It would help reduce the loitering that can lead to more serious crime. And here I thought that UU had become a "vagrancy-free zone". Someone must have seen the word "loiter" and suddenly developed a Chief Inspector Dreyfus-like tic and couldn't contain all the built-up "vagrancy" any longer! We live on Eastwood, half a block east of Sheridan. It sounded to us like the shots were right at Eastwood, although admittedly Fresh Harvest is pretty much right there too. I heard six shots. I disagree that the police were on the scene immediately. The police took at least three minutes, if not five, to storm Eastwood. By that time, someone had already sprinted down the south side of Eastwood, and an SUV had already come careening out of the alley just west of Uplift HS, turned right on Eastwood, and sped toward Sheridan. THEN . . . tick, tick, tick, tick.....siren, lots of cops all over Eastwood, by the school. The cops had been sitting at the light at Wilson since last summer, pretty much, but they seem to have gone. They were not even out earlier tonight. I was probably the SUV you refer to. I was sitting in my vehicle right behind the CTA bus that was hit and I took off as soon as I heard the shots. Yes I flew down the alley because the thugs were all running away from the scene and I wanted out of there fast. What a shame.